I. Vorobieva: 10:35 am in the capital and you’re listening to the “Echo of Moscow” radio station. As promised, we’ve got something of a surprise: a topic that was talked about in sports, but which we’ve now decided to cover in more detail. Live on the air by telephone to the Echo of Moscow radio studio, we’ve got FIDE President Kirsan Ilyumzhinov. Kirsan Nikolayevich, good morning. I. Vorobieva: Could you tell us where you’re live from? A. Osin: If it’s not a secret. K. Ilyumzhinov: I’m traveling just now. I’m being driven around Libya and we’re passing through the town of El Azizia, where the Italian company Eni once built a gas-processing plant – right now we’re passing that plant. I. Vorobieva: Could you tell us where you met and if it’s true that you met with Mr. Gaddafi? K. Ilyumzhinov: Yesterday morning I met with his eldest son, Muhammed Gaddafi, the President of the National Olympic Committee – he was the one who invited me to visit Tripoli, Libya. And after lunch we met with Colonel Gaddafi in his residence in Libya. Well, we played chess there, and drank tea. A. Osin: And could you tell us what was the purpose of travelling to that country where a war’s going on just now? K. Ilyumzhinov: It was a working visit. In October last year at the FIDE General Assembly we declared 2011 the Year of Africa and of the support and development of chess, particularly through the “Chess in Schools” programme. So in the last few months I’ve already visited South Africa, Nigeria, Zambia, Kenya and now Libya. Today I’ll be in Tunisia, then Egypt, Morocco, Yemen. I. Vorobieva: Kirsan Nikolayevich, could you tell us – well, as far as I can see, it wasn’t difficult for you to meet Gaddafi? K. Ilyumzhinov: Well, I’ve known him for a long time. We’ve been acquainted for more than 10 years, and every time I come to Libya… We held the World Chess Championship here in 2004, where there were 128 chess players from 56 countries around the world. Gaddafi took part in that. More than that, he allocated one of his residences for receptions. And therefore I’ve got long-standing ties with him. Therefore when I arrived now, not planning to meet with him – I had meetings and negotiations with the Minister of Foreign Affairs, the Minister of Education and the Minister of Sport. But then his son suggested, his son said that his father would like to meet and spend some time together. I. Vorobieva: Well, could you tell us what Gaddafi said to you. After all, he probably said something about what’s happening, about some sort of plans for the future? K. Ilyumzhinov: Well, of course it was a friendly conversation. He asked me about my impressions. The first question was: “Weren’t you afraid to come here?” Everywhere on television they report that it’s being bombed. It’s true, when we arrived we heard bomb blasts to the west of Tripoli. Every day there’s bombing here. Well, of course, it’s a little worrying, but I told him that of course it’s not the same Tripoli, not the same Libya, as it was a few years ago. But then he said: “Everyone wants me to go. But where can I go? I don’t hold any post”. Well, it really is true that it’s nonsense when people demand he goes. He’s not the president, not a minister, not the speaker of parliament. He’s simply the leader. I. Vorobieva: So he’s not intending to leave Libya? A. Osin: Tell us, Kirsan Nikolaevich, before your trip and learning of your intentions – did people try to forestall you or talk you out of it, at a Russian or international level? And if so, who? K. Ilyumzhinov: Not at all, it was a working trip, normal. I was in Afghanistan recently. Now my next trip in the middle of July will be to Baghdad – we’re holding a chess seminar there. And then I’ve got the “Chess in Schools” programme. 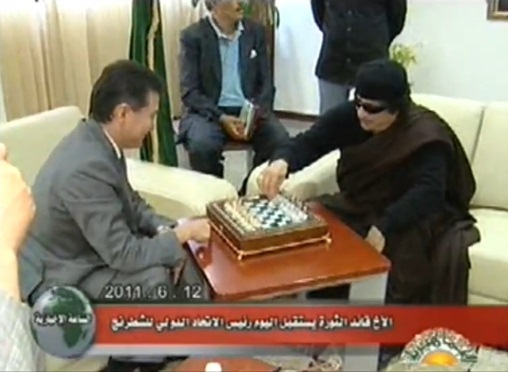 I’m also grateful to Gaddafi who in his time has also aided the development of chess in this country. And yesterday as a result of my meeting with the Minister of Education we agreed that from 1 September chess will be introduced as a compulsory subject. No-one tried to dissuade me as these are my normal working visits. Well, some FIDE colleagues asked me, of course. One of the FIDE Vice Presidents was supposed to fly with me, but he claimed that his wife wouldn’t allow him. A. Osin: No, but don’t you see what the issue is? After all, world society, or to be more precise, a significant part of it, considers the official authority now not to be Gaddafi at all, and Gaddafi seems to have been declared persona non grata. But nevertheless, you met him. K. Ilyumzhinov: Well, I’d be happy to meet with anyone. I was also a politician in the past. If there was a parliament, elected by the people, or a government, chosen by parliament. Currently all the embassies of the Russian Federation are located in Tripoli, and the ministers – they’re chosen by parliament, which was elected by the people. So then, I met with the Minister of Education, the Minister of Foreign Affairs i.e. the legitimate authorities. If there’s going to be a new authority, then of course I’ll also meet with that. But FIDE is a public sporting organisation, outside of politics, and we meet whoever appears to be legitimate. At the moment the government located in Tripoli is legitimate for the international community. If that wasn’t the case, then the embassies of the foreign countries would no doubt have switched to another city. But well, I don’t know, that’s simply my opinion. I’m not a politician. I came here as a sportsman. I. Vorobieva: I see. Kirsan Nikolaevich, all the same, chess is a game, a type of sport, in which people play calmly i.e. they’re focussed. Didn’t you get the impression that Gaddafi was somehow frightened, that he was panicking? Did I understand correctly? K. Ilyumzhinov: No, very calmly. My Vice President Georgios Makropoulos from Greece says: “But on television here they’ve been broadcasting that he’s ill, that he’s lying in hospital, that there’s something wrong with his head”. He’s normal, adequate. We played chess and talked. K. Ilyumzhinov: Well, he’s of course weaker, much weaker than me, but overall it was interesting. His son, his elder son, Muhammed Gaddafi – he’s a serious player who knows chess theory. The leader, however, is simply an amateur who knows how the pieces move. Well, and he knows how to give beginner’s mate. I. Vorobieva: So you came and beat him? K. Ilyumzhinov: Well, in terms of diplomacy you can’t win. We agreed to a draw – I offered him a draw. I. Vorobieva: Of course. That’s clear. Thank you very much, Kirsan Nikolaevich, for finding the time to talk to us live. I repeat that on the telephone to us from Libya was FIDE President Kirsan Nikolaevich, who recently met with Muammar Gaddafi and even played chess against him. On Friday he phoned and informed me that he was intending to travel to Tripoli to discuss questions concerning the International Chess Federation, and was hoping to play a game with Gaddafi. I advised Ilyumzhinov to choose White and play e2-e4, and let Gaddafi know that his game is entering the endgame. It’s not clear whether the message was passed on. It’s not so easy to get to Tripoli just now. How did you get there? As a chess player, as a professional, I can say that Gaddafi played the Ruy Lopez excellently. In a plane (laughs) – I’ve already flown to 31 countries. Now I’ll fly to Laos, Cambodia, Vietnam. I’ll also meet the rulers there. The conversation with Gaddafi was just a normal part of my job. I don’t understand why it’s created such a stir. One other detail from the interview is that Ilyumzhinov said the journalists had got the wrong end of the stick yesterday. He wasn’t in Tripoli to discuss a chess tournament. Why am I not suprised that the former evil dictator of Kalmykia is lending support and comfort to a kindred spirit, and the current leader of a rogue organization, FIDE, is lending support and comfort to a rogue state? Great Interview,thank you.Got a feeling he’ll win.As he says ‘I live in the hearts of millions.’ I agree. Yep, there are a couple of excellent Sutovsky interviews, and another couple of interviews with Gelfand and Grischuk (I hope to publish one tonight, and maybe one tomorrow). I had to leave them last week as I was translating Aronian – then Ilyumzhinov’s madness intervened. Whoa..you are hardworking Mishanp :) once again, kudos to your site, you are doing a great job. Yep, Thomas – Mikhail Margelov, Medvedev’s envoy to Libya, is also quoted in my article above telling Ilyumzhinov to play e2-e4 and inform Gaddafi he’s entering the endgame – which would of course mean prior contact with the Russian government. Ilyumzhinov’s been saying different things though – the funniest interview is this one: http://www.gazeta.ru/politics/2011/06/14_a_3660917.shtml In the middle of it Ilyumzhinov denies he was on any kind of mission, or told to convey anything. Then the text in bold is when the interviewer apparently confronted Ilyumzhinov with the Kremlin quote you mentioned – and Ilyumzhinov immediately changes his story to say he was on a mission. Plus of course we’ve now got the FIDE Press Release where he claims he was trying to help the cause of peace in Libya… when before he simply stated he was doing chess business. Another thing that’s not clear is whether he was expecting to meet Gaddafi. If Margelov’s statement is true then Ilyumzhinov was already expecting to play a game with Gaddafi before he went to Tripoli, but Ilyumzhinov has claimed in most of the interviews that it was a surprise he was invited to talk to Gaddafi. Add that to the fact that the Russian press will print anything if you pay them enough (Ilya Levitov said that before he became head of the Russian Chess Federation…) and it’s all very murky. Today Ilyumzhinov returned in Libya. Again. He missed his fellow so much that he couldn’t stay away from him. How sweet! This time he doesn’t seem to have met Gaddafi senior – although his son (via Ilyumzhinov) mentioned something about death squads hunting his father. He’s even said he’s going to back to Libya on 20th July, because they need to translate a contract about Chess in Schools into Arabic. Seems like a very sensible use of the FIDE President’s time and budget.